For keeping 4 frames or standard size. 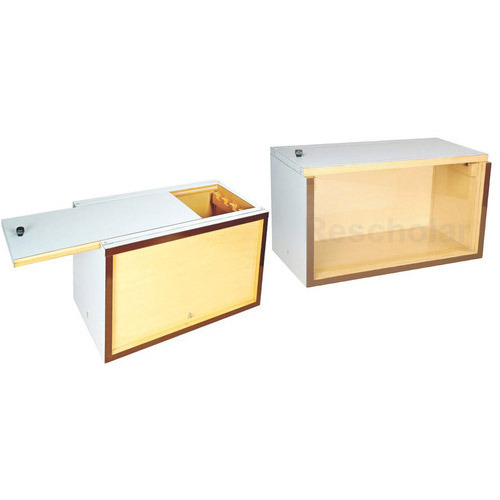 Provided with glass on both sides covered with detachable sliding wooden covers. Hole in base allows bees to move freely. Labcare Scientific is amongst the leading exporters, manufacturers, suppliers, distributors, wholesales, traders, retailers and importers of this highly commendable range of Scientific Lab Equipment, ever since our establishment in the year 2011. The offered range is made up of the finest Water Testing Meter, Millipore Kit Product and Water Testing Kit. Making of this range is done in compliance with the set industry norms and guidelines, utilizing the finest raw materials and modern machines. In addition to this, the finest Calibration Service, at the most reasonable rate possible. The highly developed state-of-the-art infrastructural facility at Labcare Scientific, has been laced with all the necessary machinery and equipment, needed for the attainment of several of the firm’s predefined goals and objectives. For reasons of managing the firm’s operations in the best possible manner, the facility has been parted into several highly operational units. The facility regularly upgraded, helps us in the maximization of our reach in the market and our production capacity. Further, our ethical work practices have helped us generate a huge client base. We are exporting our quality products all over the globe and importer from Europe and Asia.